With the International Add-ons, you will enjoy all the wonderful core components that Aardvark Israel has to offer as well as the option travel to different countries throughout the world during your time in Israel. 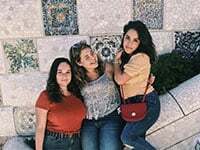 Through exciting and memorable trips designed to enhance your semester or year in Israel and deepen your understanding of the greater world around them, you will also gain a fuller appreciation for the reaches of the Jewish community worldwide. 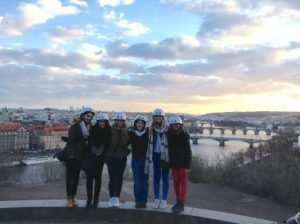 The trips are designed for the students to have a great time, but at the foundation of each itinerary is a strong educational rationale designed to enrich the participants. Traveling abroad will illustrate to participants how much Israel has become home to you. After arriving in Israel, you will quickly get used to living as a part of a Jewish majority surrounded by Jews all day long. As you journey off to foreign lands, you will find your travels out of Israel will actually serve to contextualize your experience in Israel and both broaden and strengthen your conceptions of Zionism and Jewish Peoplehood. Each trip provides a fun break from the routine, allowing you to take a step back and gain perspective, remembering that your gap year experience is time for exploring who you really are as an adult and Jew. 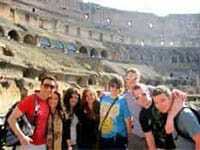 On each trip, you will visit the major tourist attractions and experience the local culture. Some trips focus on exploring one specific city while others take you throughout the country. The trips will also teach you about the history of the Jewish communities in the area through meeting local Jewish residents, visiting Jewish museums, attending synagogue, and/or participating in Jewish walking tours. In nearly every country, you will be hosted by the Israeli Embassy and have a meeting with the Israeli Ambassador or other senior official. And, you will have an amazing time throughout your travels! All trips will be led by an Aardvark staff member and professional local tour guides are utilized for some aspects of the trips. While abroad, programming in Israel continues for other Aardvark participants. Although you will miss some volunteering, classes, and activities, you won’t miss any of the program highlights. Students enrolled in courses for academic credit will arrange with their teachers to make up any work they may miss while abroad. Kashrut and Shabbat An important part of experiencing each country and its culture is enjoying the local cuisine. There will be dairy and vegetarian options provided for those who observe kashrut. Any student observing a stricter level of kashrut will be accommodated upon request. Trips will be Shomer Shabbat as determined by the needs of the group. What is included? The tuition for the International Program includes the core Aardvark program in Israel, plus all aspects of the International trips such as round-trip airfare from Israel, local transportation, accommodations, three meals per day abroad, entrance fees to sites, tour guides, insurance, tips, and chaperone(s). The cost does not include visas and immunizations (if required) or personal spending money and souvenirs. Vaccinations? In most cases, vaccinations are only required for the Ethiopia trip. However, families are encouraged to speak with their doctor or visit a travel clinic to determine which immunizations are recommended for their child. The cost of vaccinations are not covered by Aardvark or the insurance provided by the program. Spain – Fall Semester: Spain had a Golden Age for the Jewish community until it ended in 1492 with the horrific Spanish Inquisition. This trip to Barcelona and the surrounding areas will explore the ancient Jewish community of Catalonia, its personalities, and interact with the new community that has arisen since the Spanish expulsion. Students will also see the Modernista architecture that has made this city so famous and art lovers will appreciate the city’s wealth of museums. Sports lovers will enjoy the Olympic village and being in the presence of the world’s greatest soccer team. The trip will combine, culture, history, food and all the excitement that Barcelona has to offer. Click here for more on Spain. Czech Republic Fall Semester: Prague’s historic and cultural values is as rich and varied as the many spires which adorn the rooftops of its buildings. Having survived centuries of expansion and modernization, Prague is still renowned for its heritage and has been venerated with titles such as “the city of a hundred spires” and “Golden Prague”. These attributes are deservedly bestowed upon this majestic city built upon the Vltava river. The countries rich Jewish legacy will be explored, and you will have the opportunity to trace the rise and fall of the Jews of Prague in the preserved synagogues and infamous Theresienstadt. 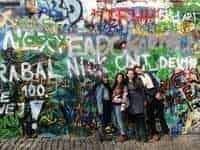 Our visit to Prague will allow you to experience major tourist sites, including but not limited to, the Charles Bridge, Prague Castle, a beer hall, the old town, and the world renowned Cesky Krumlov (a small city in South Bohemia) while also participating in a local Prague Shabbat. Click here for more on Czech Republic. 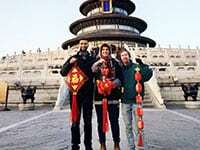 China– Fall Semester: “Made in China.” You have seen this stamped on most of the products you use – now it’s time to go see from where it all originates! This trip is focused on Beijing, a city of 22 million people. Some of the famous sites you will see include: Tiananmen Square, the Great Wall, the Forbidden City, Lama Temple and more. A visit to the Israeli embassy will allow you to appraise the current connection with Israel as well as delve into the history of Jews who live in China. Finally you will be able to brag that you visited China while none of your friends back home have. Click here for more on China. Ethiopia– Spring Semester: When you think of Africa, you probably picture colorful dress, exotic foods, and animals usually found in a zoo. Visiting Ethiopia you will see a beautiful landscape, experience a culture totally different from your own, and grow to appreciate much of what you take for granted. You will interact with the local “Jews”, visit a rural village which was once a center of the Jewish community and hear the story of their mass aliya to Israel, taste the local delicacies, be a guest of the Israeli Embassy, and tour ancient castles. This will be an unforgettable experience. Click here for more on Ethiopia and here to see a video about the Ethiopia trip created by one of our students. Germany – Spring Semester: Germany looms large in Jewish history and is a country that has changed tremendously in the last few decades. Germany is in fact a strong supporter of Israel today and has one of the largest, and fastest growing, Jewish communities in Europe. Your visit to Germany will explore both the country’s past and present. We will visit the site where the Final Solution was drafted, a concentration camp, the Jewish Museum, the Israeli Embassy, an authentic German Beer Hall, and more. Click here for more on Germany. 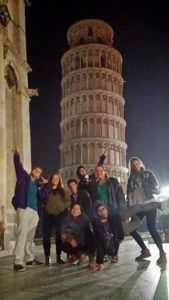 Italy Spring Semester: From art to food to politics, Italy’s impact on the world has been immense. A place of olive oil, pasta, wine, mafia, sunshine, Roman ruins and Renaissance palaces, Italy has a lot to give its tourists. Come see this beautiful country and three of its main cities: Rome, Florence, and Venice. Since the time of Judah Maccabee, Jews have had a presence in Italy and have left their mark on the country. Today about 50,000 Jews make Italy their home and you will have a chance to meet some of them to hear about their lives as a small minority in a large Catholic country. While visiting, learn about the relationship between the Vatican and the State of Israel as well as the impact of World War II on the Italian Jewish Community. On the Aardvark World Adventure program you will see, taste, and explore ancient and modern Italy through the lens of Israel and the Jewish world. Click here for more on Italy. Nepal Cultural Exchange – Spring Semester: As part of a global community, Jews share a responsibility to be involved in making the world a better place. In order to best fulfill this mission, we need to both educate ourselves about and contribute to communities in need – both locally and globally. 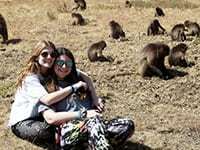 While in Israel you will engage with organizations working in the field of social justice, and through our partnership with Tevel b’Tzedek, you will have the unique opportunity for a cultural exchange and volunteer experience in Nepal, a country with immense poverty and hardships, but also a thriving culture and natural beauty. On a two week trip abroad, you will live with a Nepalese family, volunteer in a rural village, trek in the Himalayas, explore interesting sites in the nation’s capital and participate in an educational seminar in Katmandu. Click here for more on Nepal. 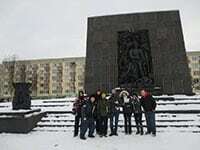 Poland – End of Spring Semester – On this trip we’ll explore the rich Jewish History of Poland which lasted over 1,000 years before its eventual destruction at the hands of the Nazis during the Second World War. We’ll see extermination camps where not only Polish but most of European Jewry was wiped out. We’ll also visit ancient synagogues and Shtetl’s and large populations centers which were the center of world Jewry in the 1930’s. We’ll also experience some of the re-awakening of Polish Jewry nowadays and see some of Poland major tourist sites. The trip will be one that stays with you forever. Click here for more on Poland.